Through blogging, I’ve had some amazing opportunities. Popcosmo has opened doors to things that I thought were unreachable, but one of the greatest aspects of blogging is meeting new friends. I have had the awesome chance to become super close with a few other teenage bloggers, and I’m starting a little series where I showcase some of my “besties.” First up is miss Gracey from Stripes & Peonies. Her blog is absolutely adorable, and Gracey has some of the best outfit of the day pictures! 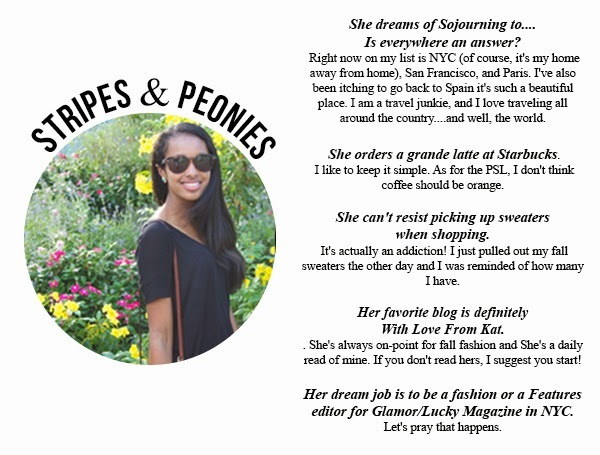 Be sure to check out Stripes & Peonies, she’s amazing!